After the first period the Nashville Predators trailed the Vancouver Canucks 2-0. After that, it was all Nashville. Colton Sissons scored just 37 seconds into the second period, and following a review (yes, a Sissons goal under review), it was confirmed as a goal. The comeback continued in the third period as Nick Bonino notched his 16th of the season with less than five minutes remaining in regulation to tie the game. Then, with just 21 seconds remaining in regulation, Filip Forsberg got the puck to Ryan Johansen, who might have actually been making a pass, but it deflected in, for the game-winning goal. That goal was also reviewed for offside, but was quickly confirmed. With the win, and the Jets falling in overtime to the Avalanche, the Nashville Predators control their own destiny for seeding in the Stanley Cup playoffs. If they win Saturday against Chicago, they win back-to-back Central Division championships. Many other scenarios would need to happen to secure that if they lose, but it’s simple, win the game, win the division. 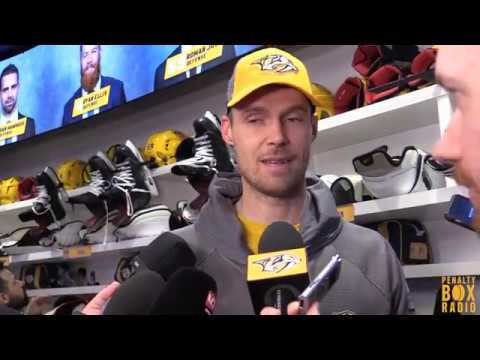 Post game reaction from Colton Sissons, Ryan Johansen, Nick Bonino, Austin Watson and head coach Peter Laviolette.